Traditionally, the two weeks surrounding July 4th are dark (no scheduled meetings) and it provides an opportunity to take some time off and get away from the office. Not this past week. Because of traveling schedules, yesterday afternoon was the best time for all five of the Supervisors to meet. The next opportunity to do so is July 24th. We had a lively discussion and have homework to do that required a continuance of our deliberations. The LA Times has the first piece below covering this story. The second piece, from the Mission Viejo Patch, provides a little more detail. The third piece on the subject is from the Voice of OC. MSNBC provides the fourth piece. If you wish to see the NBC clip, it can be found at http://www.nbclosangeles.com/news/local/Santa-Ana-City-Councilman-Carlos-Bust…. However, it shows a most interesting editing job to get a certain point across. I would say they read more into it than necessary. Interspersed between the Bustamante activities are the topics of total compensation, public employee defined benefit pension plans, and this year’s negotiations with our two largest bargaining units. The OC Register provides a helpful letter to the editor in today’s Saturday edition, which is the fifth piece below. It is followed by the final piece, also from the OC Register, covering my recent e-mail to county employees (see MOORLACH UPDATE — Pension Hawk — June 22, 2012). This communication generated some questions about the trends for specific bargaining units. Below are the trends for the County’s two largest bargaining groups: the Orange County Employees Association (OCEA) and the Association of Orange County Deputy Sheriffs (AOCDS). As a reminder, for all County employees, the average total compensation per employees changed from $86,524 in FY 2007-08 to $101,465 in FY 2011-12, a growth of $14,941 (or 17.3%). Meanwhile, property taxes have grown scarcely more than 3% over this same time period. 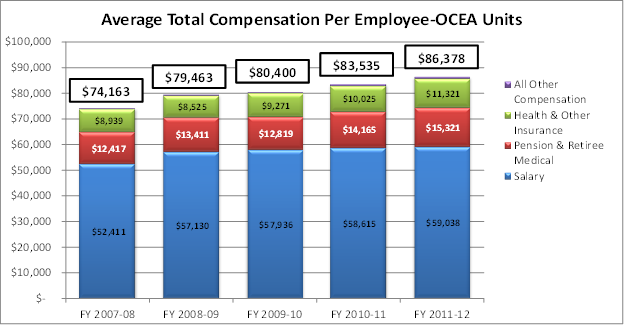 As shown in the chart above, the average total compensation for all OCEA-represented employees has grown from $74,163 in FY 2007-08 to $86,378 in FY 2011-12, a change of $12,215 (or 16.5%). As shown in the chart above, the average total compensation for all AOCDS-represented employees has grown from $132,893 in FY 2007-08 to $152,985 in FY 2011-12, a change of $20,092 (or 15.12%). It is important to understand one critical idea: I am talking about increases in total compensation, not just pay raises. As you can see from the charts, average salaries for the past four years have somewhat leveled off. However, employer costs for health and other insurance, pension and retiree medical contributions, and other compensation have been rising, and will continue to do so. A paycheck is only one component of an employee’s overall compensation, but benefits should be included in the overall picture. Somewhere along the journey, it was decided that pension plans were more important than salaries. Now that retirement costs are rising, thus increasing total compensation, it will have an impact on salaries, as the County’s funding sources have leveled out and total compensation cannot increase, unless and until property tax revenues increase. Orange County supervisors didn’t take any action against the chief executive officer in a closed-session meeting held Friday afternoon. In a memo dated a day earlier, board Chairman John Moorlach requested a closed session to evaluate and discuss the performance of CEO Tom Mauk. The agenda also included an item about the possible appointment of an interim chief executive. The move came after Carlos Bustamante, a Santa Ana city councilman and former administrator in the county public works department, was charged this week with 12 felonies in connection with allegations that he sexually harassed more than seven women over eight years. In an email update Friday evening, Moorlach said he and Vice Chairman Shawn Nelson had been working together and had a telephone conversation with Mauk on Thursday morning. "Based on the tenor of that conversation, the vice chairman and I felt it was necessary to call an emergency closed-session board meeting," Moorlach wrote. But after the three-hour meeting ended Friday, Moorlach disclosed few details about what was discussed. He said Mauk’s performance evaluation had been continued to July 24 and would not comment on the remaining agenda items. He said the board had "dialogue" with Mauk and discussed ways that county executives can deal with sexual harassment in the workplace in the future. "We should evaluate the incidents in the future to see if it should be directed" to the district attorney’s office, Moorlach said. He would not say if Mauk’s dismissal was still pending. "This was a very healthy session," he said. The Orange County Board of Supervisors delayed taking action about the fate of Chief Executive Officer Tom Mauk for his handling of sexual assault allegations against the former public works manager. The Orange County Board of Supervisors did not take any action today in a closed door meeting on the fate of Chief Executive Officer Tom Mauk for his performance in connection with the case of Santa Ana City Councilman Carlos Bustamante, who is charged with sexually assaulting seven women employees when he was a county official. Bustamante was arrested nine months after resigning as executive manager of the county Public Works Department amid allegations of sexual misconduct involving co-workers. The county’s internal auditor gave supervisors a report March 2 about co-workers’ allegations against Bustamante. That report was forwarded to District Attorney Tony Rackauckas March 14, board Chairman John Moorlach said.. The board decided to continue their discussion at its July 24 meeting. “We had five people trying to do what’s right and we had a good discussion,” Moorlach said. Mauk participated in the last 20 minutes of the meeting, Moorlach said. One ideas that came out of the discussion was consideration of more training for staff to recognize criminal behavior, Moorlach said. Moorlach acknowledged that if the allegations against Bustamante turn out to be true, then he effectively covered his tracks. “He obviously knew how to select victims, which is sad, tragic,” Moorlach said. The meeting was called in response to the Bustamante case, which broke Monday when he was arrested on his way to a council meeting. Santa Ana Councilwoman Michele Martinez today called on Bustamante to resign. Martinez is concerned that residents will “badger” the council about the case against Bustamante as long as he remains in office. The council cannot take action to remove Bustamante until he has had three unexcused absences from meetings. The next council meeting is July 16. After Bustamante misses three meetings then the council can declare the seat vacant after 60 days, Martinez said. Martinez said she has told a “mutual friend” to ask Bustamante to resign, but said she has heard he does not intend to. The alleged assaults happened between 2003 and last year while Bustamante worked in the Orange County Public Works Department, according to Rackauckas. Bustamante is charged with six counts of false imprisonment, three counts of assault with the intent to commit a sexual offense and one count each of stalking, attempted sexual battery by restraint and grand theft by false pretense, according to the Orange County District Attorney’s Office. The grand theft charge stems from expense reports he submitted after attending a 2 1/2-week program in Boston. Bustamante also faces one misdemeanor count each of battery, assault, sexual battery and attempted sexual battery. The charges include sentence-enhancing allegations of committing the offenses as a result of sexual compulsion and for the purpose of sexual gratification. Bustamante’s arraignment was postponed until July 26. After several hours in closed session Friday, Orange County supervisors took no formal action on the fate of county CEO Tom Mauk in the wake of criminal charges being filed against a former county manager for sexual assault. Board of Supervisors Chairman John Moorlach said the discussion on Mauk has been postponed to July 24. Mauk and his top managers have come under scrutiny following allegations that complaints against Carlos Bustamante, a Santa Ana city councilman and former manager in Orange County Public Works, were badly mishandled. On Tuesday, District Attorney Tony Rackauckas charged Bustamante, 47, with 12 felonies in relation to an eight-year period during which Bustamante allegedly sexually terrorized at least seven women who worked for him. Work behavior classes may in the future include reference to possible criminal charges, Moorlach said. “When we communicate about how you should conduct yourself in the workplace, I don’t think any of the courses say if you cross over the line there could be criminal penalties,” he said. Orange County Supervisors met behind closed doors Friday to discuss the possible discipline of a longtime County CEO in connection with the arrest Monday of a City Councilman accused of sexually assaulting female employees. The meeting included a review of Tom Mauk’s job performance, anticipated litigation, “public employee discipline, dismissal, release” of the CEO, and “appointment” of an “interim county executive officer,” according to the meeting agenda item. The meeting was called in response to Monday’s arrest of Santa Ana City Councilman Carlos Bustamante, Orange County Board Chairman John Moorlach confirmed to NBC4. Mauk was hired in 2004 to the CEO post and has held it longer than anyone since the county went bankrupt in 1994, Moorlach said. He couldn’t comment on the discipline issue, citing the personnel matter. Mauk’s office supports board policy and provides direction and oversight to county agency and department heads. Bustamante’s arrest came nine months after he resigned as executive manager of the county Public Works Department amid allegations of sexual misconduct involving co-workers. The alleged assaults happened between 2003 and last year while Bustamante worked in the Orange County Public Works Department, prosecutors said. The grand theft charge stems from expense reports he submitted after attending a 2 1/2- week program in Boston. He also faces one misdemeanor count each of battery, assault, sexual battery and attempted sexual battery. The charges include sentence-enhancing allegations of committing the offenses as a result of sexual compulsion and for the purpose of sexual gratification. A judge Thursday issued protective orders to prevent any contact between the councilman and the alleged victims. He’s free on bail. He’s expected to enter a plea to the charges at his arraignment on July 26. The June 24 Register included an editorial that interviewed Orange County Supervisor John Moorlach and alerted O.C. citizens of the coming fiscal crisis due to irrationally lucrative county employee pensions [“Pensions eat more of O.C. budget”]. The July 1 Commentary section included three “Reader Rebuttal” columns by different government employee unions. Two pension-reform rebuttals attacked Moorlach, and one, by UC Provost Lawrence H. Pitts, attacked an AP article on the pension topic. The vitriolic nature of the attacks on Moorlach, and the duplicitous presentation of facts by Pitts indicate that Moorlach’s comments must be on target. Pitts says that “UC and its employees have been steadily escalating contributions to the pension fund.” Where does he think the “escalating contributions” cash comes from? His vaunted “reforms” consist of ever-greater extractions of taxpayer cash to maintain and grow the bloated UC pensions. Orange County Employees Association General Manager Nick Berardino’s personal attacks on Moorlach are an attempt to distract readers from the pertinent facts: On average, government employees receive seven to 10 times as many dollars in their pension payouts as non-government employees. For government employees who retire at age 50, add in 15 years of health insurance premiums, at about $15,000 a year. The non-government employee taxpayers pay for both pensions. They cannot afford, and would not pay for the government pensions if they knew how inequitable their situation really is. One needn’t follow California politics too closely to realize that Moorlach is the only elected official in California with in-depth understanding of government finance. His predictions have the ring of accuracy. It takes courage to speak out as he does, given the inevitable personal attacks to come. While we may like to believe solutions can be negotiated, Sunday‘s “Reader Rebuttals” make it clear the only alternatives are bankruptcy or the ballot. Pay raises outstrip revenue growth, Supervisor John Moorlach says. After Disneyland, the County of Orange is the largest employer in these parts, with some 18,000 workers on the payroll. And we’re venturing a guess that it’s not going to be wine/roses/warm/fuzzies around the county bargaining table this year. The average total compensation of county workers grew by nearly $15,000 over the last five years, Moorlach wrote – or 17.2 percent. Meanwhile, the county’s main source of funding — property tax revenue — grew by only 3 percent. “In order to address the unsustainable trend in total compensation growth, the County is now faced with either laying off employees and reducing services in order to achieve a more tenable financial position, or finding ways to restrict the growth in total compensation in order to bring it in line with the growth in available resources,” Moorlach wrote. “The Board of Supervisors has decided to pursue the latter approach, in an effort to retain as many employees as possible and maintain service levels to the public we all serve. It won’t need to be as severe as state cutbacks — Sacramento is looking at a 5 percent slash — “but will need to be sufficient to offset the anticipated growth in other forms of compensation, like pension contribution and health benefits,” Moorlach wrote. “The Board of Supervisors will continue to pursue solutions to the ever-escalating pension costs that are crowding out salary increases for our employees, but it is clear that true solutions can only be found with the assistance of our employees and their labor representatives. “It is vital that each County employee know that this new approach to labor negotiations is born out of financial necessity and a commitment to provide the highest level of service possible to the taxpayers who entrust us with their resources. A commitment to the public is something that binds us together as civil servants, and it is what will see us through these times of austerity and sacrifice. Thank you for your continued service and perseverance,” Moorlach wrote. “… the Chair attempts to set forth a rationale for his agenda, which is to place the burden of any economic challenges the county may face squarely on the backs of its lowest-paid employees. Respectfully, OCEA is not about to let that happen. “OCEA-represented employees have always paid the full employee cost of their pension benefits. We’ve paid the employer cost of implementing the 2.7@55 retirement formula for eight years! The LA Times provided a Sunday Orange County Perspective editorial in “Go Slow on Merrill Lynch Ties.” Here’s what my comments were at the time: “I found it ironic that we forgave and showed grace to the Los Angeles Times after the County’s filing for bankruptcy. We forgave them for missing the story, for not doing the proper research and for even endorsing the incumbent and calling my concerns a ‘bum rap.’ Talk about ‘closed eyes.’ In fact, the L.A. Times is very culpable in the County’s huge investment losses, almost directly responsible if you ask me. It seems that the L.A. Times missed their lesson on grace. Oh well.” Here is their editorial in full. It’s too soon for Orange County to be embracing a "business as usual" relationship with Merrill Lynch & Co., the giant brokerage firm that played a crucial role in the county’s 1994 bankruptcy. Elected officials and taxpayers shouldn’t forget the county lost $1.7 billion on ill-advised investments during Merrill Lynch’s watch. County services continue to suffer because the county is making $93 million in annual interest payments on $1 billion in bonds sold in the wake of the nation’s largest municipal bankruptcy.